At Liberty Law Blog, John McGinnis: More Evidence for the Judicial Duty of Clarity. In a previous post, I discussed my new paper, The Duty of Clarity. There I show that the original meaning of the Constitution requires a clear violation of its terms before invalidating legislation. But the Constitution also demands that judges use the ample interpretive methods available to clarify the precise meaning of our fundamental law. Both the obligations of clarity and clarification flow from the judicial duty, a duty that is an aspect of the judicial power granted under Article III of the Constitution. Since finishing a draft of the paper, I have come across one more powerful piece of evidence for this proposition. It is widely agreed among early Supreme Court justices that this duty of clarity exists and was binding on them. Nevertheless, I had not previously found any instance in which a justice claimed that the duty was the proximate cause of a refusal to hold legislation unconstitutional. At NRO, Matthew Franck criticizes George Will: Asking Busybody Judges to Overrule Busybody Legislators. Franck is wrong on all counts. So-called substantive due process is firmly grounded in constitutional text; rooted in ideas about the function and limits of government that were accepted by the Founding generation, and critical to ensuring that the courts perform their appointed function as "bulwarks of liberty." It is Franck who breaks with Marshall, Hamilton, and Madison. [Timothy] Sandefur has already effectively demolished Franck's arguments; I come to spread salt on the ground, lest he (or others) seek to build upon it again. In general, Sandefur reasons that the unjust is the irrational, the irrational is the arbitrary, and the arbitrary is forbidden by the principle of due process. This is a string of equivocations, and begins with unsubstantiated opinion. The fact that Sandefur and I might even agree that a legislative enactment is unjust does not make it so, and it certainly does not follow that it is arbitrary under the fairly concrete meaning of due process, which requires regularity, generality, prospectivity, notice, and the like—all of which are present in the laws Sandefur lately condemns, but absent in his own favorite examples such as in Shirley Jackson’s The Lottery. The trouble with practitioners of substantive due process is that they do not so much employ logic as collapse it. I'm happy to stay out of this fight, except to note that it is not particularly helpful to originalism that most libertarian originalists tend to side with Bernick and Sandefur, while most non-libertarian originalists don't. I have not read the vast majority of the 2000-page Omnibus bill that contains the fiscal year 2016 Defense Appropriations bill. But presumably Representative Hal Rogers, the Chairman of the House Appropriations Committee, has read it. And he says that the bill “includes funds to combat the real-world threat of the Islamic State of Iraq and the Levant (ISIL).” The funds are probably located in the “$58.6 billion in Global War on Terror/Overseas Contingency Operations (GWOT/OCO) funding” that is sprinkled around the bill. The Obama administration has previously made clear that GWOT/OCO funds are used in large part for the fight against ISIL, and it surely did so again in places I cannot now find. [B]asic principles of constitutional law — and, in particular, the fact that Congress may express approval through the appropriations process — and historical practice in the war powers area, as well as the bulk of the case law and a substantial body of scholarly opinion, support the conclusion that Congress can authorize hostilities through its use of the appropriations power. Although it might be the case that general funding statutes do not necessarily constitute congressional approval for conducting hostilities, this objection loses its force when the appropriations measure is directly and conspicuously focused on specific military action. I think this is probably correct as an originalist matter (embracing the qualification in the last sentence above that "the appropriations measure is directly and conspicuously focused on specific military action"). As I argued here, the best way to think about congressional authorizations to use force (as opposed to formal congressional declarations of war) is that they are delegations to the President. They allow, but (typically) do not require, the President to use force in specified places or against specified opponents. Thus they do not "declare war" in themselves, but they authorize the President to declare war (whether by proclamation or by using force). Assuming these authorizations satisfy the non-delegation doctrine (whatever one thinks it take to do so), there should be no constitutional objection to them. If the authorization is "directly and conspicuously focused on specific military action" it should satisfy all but the strongest version of the non-delegation doctrine. And war-powers-related delegations have a long history, going back to the 1798 Quasi-War and the wars against the Ohio Valley tribes in the early 1790s. If war powers delegations are constitutional, then I don't see why they couldn't take the form of spending authorizations. A spending authorization seems necessarily to approve the underlying action. If I say to my son "Here's $2 to buy an ice cream," and he buys an ice cream, he is going to be quite surprised if I then say "hey, I didn't say you could have an ice cream." Again, the specificity limit is key: simply giving my son $2 as an allowance does not authorize him to spend it on anything he wants (such as ice cream). But if the ice cream is specifically mentioned or clearly contemplated when I hand out the money, it seems hard to say that it isn't authorized. [T]he word "shall" would have established a legally binding obligation under international law--one that the U.S. delegates apparently thought would (as a matter of U.S. constitutional law) require the approval of either two-thirds of the Senate or majorities of both Houses of Congress. There seems a potentially substantial degree of wiggle room in that last statement. Is a binding agreement immune from the congressional/senatorial approval requirements because its binding elements are "consistent with already approved previous agreements"? I suppose this depends on the nature of those "elements" and the meaning of "consistent with". But I am skeptical of this principle as a textual matter. Either an agreement is a binding, in which case it needs approval (unless it is of the subject matter that can be done by sole executive agreement), or it is not a binding agreement. Otherwise, I do not see how the President is complying with the constitutional direction that all treaties gain approval. There's no exception for treaties that are similar to prior treaties, nor should there be. The fact that an obligation has been approved by the Senate in one agreement should not automatically mean it can be added to a second agreement without the Senate's further approval. The two agreements may have (for example) different parties, different reciprocal obligations, different durations and termination provisions, and different dispute resolution procedures. It's hard to say for sure in this case without identifying the nature of the binding obligations, but I would say that the acknowledgement of some binding obligations in the agreement would make it hard to defend constitutionally. The federal government has been arguing that the terror attacks in Paris and San Bernardino require that it be able to circumvent encryption of messages, something they have sought for a long time. A cynic might argue that they see their opportunity and are seizing it. But let's assume that they actually need the access to encrypted messages to combat terrorism. How can the government be monitored so that the acquired information is not used for other purposes, such as non-terror law enforcement or disclosure for political purposes? Here is one idea. Congress should pass a law that prohibits the use of this information for any purpose other than the prevention of terrorism. The sanctions for a violation should be both criminal and civil. Moreover, an Inspector General should be given the tools to uncover any such wrongdoing. It might be thought that the executive branch might simply choose not to prosecute the individuals involved, as it has have done so many times in the past. But I believe there is a way to prevent such behavior. Congress should require the executive to bring prosecutions for violations of this unauthorized disclosure law whenever it has probable cause to believe a violation has occurred. While the executive might argue that it is unconstitutional to take away its prosecutorial discretion, I have argued in the past this is untrue. But the executive might argue that it believes it is unconstitutional to take away its prosecutorial discretion and therefore choose not to enforce the law requiring prosecutions. To prevent this from occurring, Congress should make the encryption bypass authority nonseverable from the prosecution requirement. That is, Congress should include an anti-severability provision that states that if the prosecution requirement is not enforced based on constitutional grounds, the encryption bypass authority should also be unenforceable. There is nothing problematic about such a provision. Many laws contain provisions that are not severable – if one provision is found to be unconstitutional, then another provision is unenforceable – because Congress either implies or states it would not want the one provision enforced without the other. My guess is that the executive would be reluctant to lose its encryption bypass authority and therefore would bring the requisite prosecutions. I believe that such non-severability provisions would be a useful check against the executive. I hope to blog about them in the future. 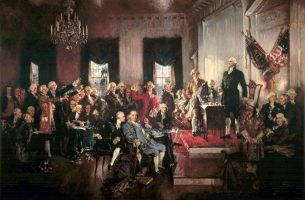 Inspired by Kurt Lash's post Do Historians Understand Originalism? (noted here) and the Fordham Law Review's historians' symposium, I offer the following invitation (or challenge, depending on how you look at it) to historians who are originalist critics. Saikrishna Prakash and I (separately, but with lots of overlap) have put much energy into developing an original meaning account of the declare war clause. While we differ on some details, our general conclusion is that the clause substantially limits the President's ability to initiate the use of military force without Congress' approval. My impression (with all due modesty) is that this account has been generally persuasive to a fair number of modern originalist-oriented legal scholars, with the significant exception of John Yoo and a few others. (Their position is that the clause does not, or at least does not materially, limit the President's use of force). I am not aware that any pure historian has commented in detail on this debate. My invitation to historians is this: tell us where we are wrong. We could be wrong at least three ways. (1) Perhaps there is no identifiable meaning of the declare war clause. That is, perhaps we can't tell what it's language meant, how people of the time understood it, what the framers thought it's role was, etc. ; the Yoo position is as likely to be right as ours, but the bottom line is that it's all indeterminate. No useful light can be shown on the matter. So, really, one can't say that the clause limits the President. I would like to hear, though, why we can't reach any useful conclusions on the matter (since I think we can). (2) Perhaps the Yoo position is the better reading (he uses a lot of history and historians in support). I'm not aware of any pure historian taking this view, but I would be interested to hear their account. (3) Perhaps our conclusion is right, but we are getting there the wrong way. This would be the most interesting, I think, because it would illustrate the differences in how historians approach original meaning and how legal scholars do. But I think it's not sufficient to quibble over isolated pieces of evidence (though I welcome quibbles as well). What I'd most like to see is a historian's account of how the clause limited the President. I think this is a pretty fair test. The meaning of the clause is not obvious, as the idea of declaring war is ambiguous and somewhat outdated, so it requires some attention to history to understand it. Assuming most academic historians lean somewhat to the left politically, there is less likely to be a policy-driven reaction against originalist conclusions here. Legal scholars, while having a clear majority and minority position, are far from unanimous, and the clause's meaning is highly contested among political commentators and executive branch and legislative branch lawyers. So it is not an easy or intuitive case. Yet ultimately I do think there is a answer, and I've tried to make the case as best I can (and Prakash makes it better). I mean this invitation in an entirely serious and non-confrontational way. I really would like to understand, concretely, what it is that historians don't like about originalism, as I think we can learn from each other. I think working in depth on a particular issue, rather than in the abstract or on the basis of scattershot examples, would make the discussion more meaningful. So it is a genuine invitation. But it's also a bit of a challenge. Because if historians are going to say that originalism as an enterprise is flawed (as opposed to just that some arguments are flawed or that some clauses can't be given meaning), they have to show that all (or most, anyway) originalist analyses are flawed. Since I'm pretty confident of this one, I offer it up as a target. To make their criticism stick, I think they need to knock it down. So what do you say? I think it would make a great article. 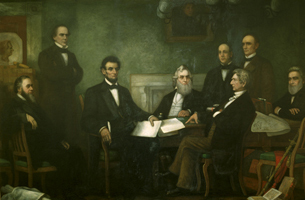 I just returned from a conference of law-department and history-department legal historians discussing the Thirteenth Amendment (well done, Randy Barnett). As I listened to historian after historian explain to us law professors just what we are doing wrong, I was surprised by how ignorant some well-known historians are about public meaning originalism. While I appreciate Eric Foner’s bravely spoken declaration (to a room full of originalist scholars) that “there is no such thing as an original meaning of a text,” I respectfully disagree. In fact, I think his recent op-eds about the true meaning of the Thirteenth Amendment suggest that even Eric does not really believe historical inquiry is incapable of discovering original legal meaning. Actually, I am quite certain that law professors are far, far ahead of Foner in developing theories of textual interpretation and methodologies for identifying common historical patterns of language usage. And where historians like Foner seem to believe that historical knowledge is directly applicable to contemporary legal problems and politics, originalists understand that historical meaning is one thing, but applying such meaning to contemporary cases requires a separate normative argument. And woe to the originalist who fails to reveal her priors! (and continuing with some harsh words for Jack Rakove's piece in this symposium in the Fordham Law Review). RELATED: Ian Bartrum (UNLV) has this recent post on Prawfsblawg about the Fordham symposium. Secretary of State Kerry is applauding the agreement reached by the climate change conference in Paris. But (as far as I can tell) he has not been clear on whether it is a binding agreement under international law. For reasons I have discussed here in connection with the Iran nuclear deal, that makes a huge difference constitutionally. As I assume the Paris agreement will not be submitted to Congress or the Senate for express approval as a treaty or a congressional-executive agreement, the question is: how can it be constitutional? (1) It could be a nonbinding agreement. This is the most promising constitutional route. As I've argued previously, the President likely has power to conclude nonbinding agreements as part of his executive power in foreign affairs. There remain a couple of concerns (which I developed in connection with the Iran deal). The most prominent is that, in my view, the President has a constitutional obligation to make clear that a nonbinding agreement is nonbinding. Although the State Department eventually made clear that the Iran agreement was nonbinding, the delay in doing so was problematic, especially to the extent it may have misled other parties to the agreement or inadvertently created obligations under international law. Second, on a quick read, the Paris agreement does not look like a nonbinding agreement; rather (as Dan Bodansky anticipated here), it looks like an ordinary multilateral treaty in its formalities (full text here; note for example the references to "entry into force"; the provision that no reservations may be made; and repeated use of "shall" in reference to parties' undertakings). The United States cannot simply declare something to be nonbinding (especially a multilateral agreement) if the other parties to the agreement reasonably do not understand it this way. Third, as I argued in connection with the Iran agreement, it is problematic for the President to commit the United States, even in a nonbinding way, to specific actions beyond the President's term (and thus beyond his control). It amounts to promising something he cannot deliver. I haven't looked closely enough at the Paris agreement to know whether this is a problem. (2) It could be an executive agreement. Again, as discussed in connection with the Iran deal, in my view the President has some limited power to enter into binding agreements on his own authority -- but only those that are short-term, minor, or within his specific substantive areas of constitutional authority such as military agreements. It would seem a stretch to put the Paris agreement in this category. (3) Perhaps the President could argue that the agreement was approved in advance (or more likely that authority was delegated to him) by a prior statute. This seems unlikely, but it depends on a review of applicable statutes that I haven't done. I agree with Oona Hathaway in this article that the standard for finding approval/delegation to enter into international agreements should be fairly high given the "lock in" effects of a binding international agreement. One would want to be confident not only that Congress wanted the President to take action in a given area, but also that it wanted the President to be able to lock in that action against future revision. The Paris agreement seems to raise two other possibilities. First, suppose the agreement is binding in a formal sense (that is, it has the appearance of a binding agreement, the parties intend it to be binding, etc.) but the actual substantive provisions do not in fact impose any material requirements upon the parties. My impression is that this might be a fair description of the agreement. Can the President enter into such an agreement on his own authority? Maybe, on one of two theories: (1) despite the formalities, it is in effect an nonbinding agreement and so should be treated as one for constitutional purposes; or (2) because it does not impose any material obligations on the United States, it can be concluded as a (putatively binding) executive agreement. Finally -- and I am only speculating here, again not having studied the relevant provisions -- perhaps the Paris agreement will be incorporated into another binding agreement, specifically the pending Trans Pacific Partnership (TPP). The TPP makes a reference to the Paris agreement; if the reference is sufficient to incorporate the Paris agreement into the TPP, then Congress' approval of the TPP (if it happens) arguably would be an approval of the Paris agreement as well. If you think Congress' approval (as opposed to the Senate's supermajority approval) is constitutionally sufficient for the TPP, that might be a way to make the Paris agreement constitutional. At least, it's something for Congress to think about as it considers whether to approve the TPP.